Dunlop have launched a new video as part of their “Groutstanding” campaign to showcase their new range of GX-500 Flexible Grouts. The new video highlights the wide colour choice available in the range including: Polar White, Jasmine Cream, Harvest Beige, Sahara Sand, Conker Brown, Mist Grey, Graphite Grey and Liquorice Black. 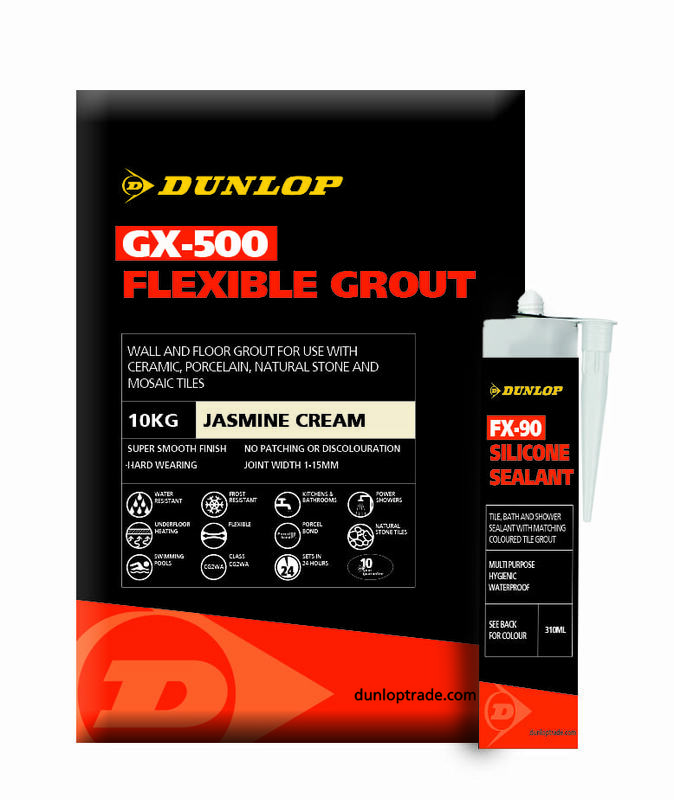 Suitable for wall and floor tiling, GX-500 is Dunlop’s most advanced tile grout to date, and provides builders, tilers and contractors with all-round qualities including water and frost resistance, flexibility, a reduced risk of cracking and surface discolouration and a super-smooth but hard-wearing finish. Because of its unique formulation, it can be used from 1-15mm joint widths with most tile types including ceramic, porcelain, natural stone and mosaic tiles. What’s more, it can be used in complex installations where flexibility is required, such as over underfloor heating, swimming pools and heavily trafficked areas. Available in 2.5kg and 10kg sizes, Dunlop GX-500 can be ordered now from stockists across the UK. Alongside GX-500, Dunlop has launched a range of colour-matched silicone sealants – FX-90. Ideal for jointing tiled walls and floors in interior or exterior locations, it is multi-purpose, hygienic and waterproof for the perfect finish. Debi Boulton, Sales and Marketing Manager at Dunlop said: “The new video provides the perfect showcase of our new GX-500 Grout and the multitude of colours available in range.